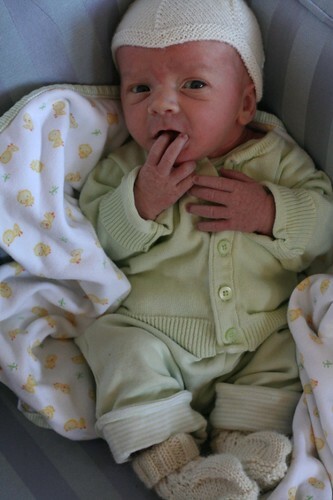 Little Odysseus was born December 4th, weighing in at 6 lbs 14 oz. We’re all doing well and enjoying the snuggly baby. Beatrix is especially proud to be a big sister. Exercise Before Knitting will not turn into a baby blog, I promise; however, I do have a couple of baby knits to share now that he’s here. The sweet little elf cap will fit for a week, but that’s OK, it was worth it. I will likely make him another one once he outgrows this. 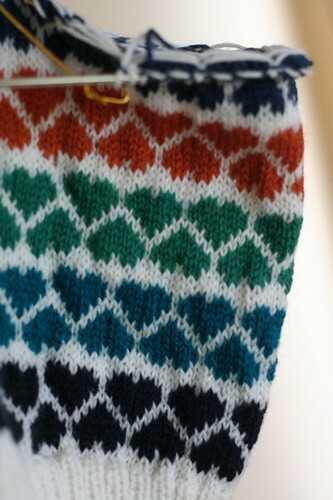 Normally, I rather dislike knitting booties because of all the seaming. This seamless pattern is a definite win! I used worsted weight yarn and they’re a bit big for a newborn, but DK weight would surely fit. I will most certainly use this pattern again! 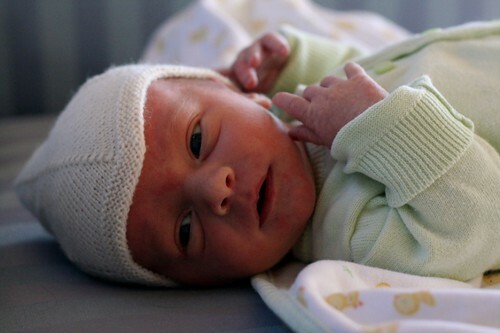 More baby photos over on Flickr. Waiting for babies to be born is not my strong suit. Oh, who are we kidding? Why qualify it? Waiting is not my strong suit. I decided to devote some of this interminable wait to knitting up a long overdue gift. I settled on knitting a stole (recall that around here, we don’t call them shawls) for a woman who has helped me enormously with my medical school applications. After much deliberation, Muir seemed the perfect combination of easy and interesting. I feel a bit too absent-minded these days to work on anything complex; thus, I needed a pattern I could not easily mess up! I used some stashed Classic Elite Yarns Fresco for a heavier weight stole. 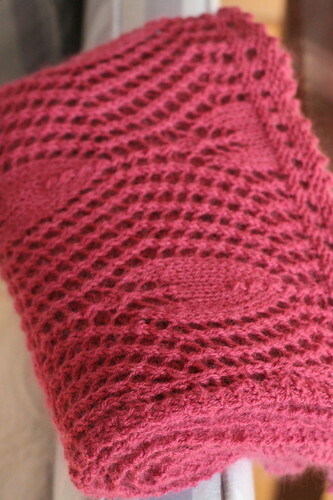 Consequently, I only cast on 93 stitches for 2 (instead of 3) pattern repeats across. I stopped after 11 full repeats in length, although I probably could have eked out a 12th repeat if pressed. After blocking, the stole measures 24″ x 66″, although I think it will stretch quite a bit more in length when worn. Muir was the only knitting project I really wanted to finish before Baby Brown’s arrival. While I am working on several other projects on post-baby deadlines, here are two that I hope to finish in the coming months. 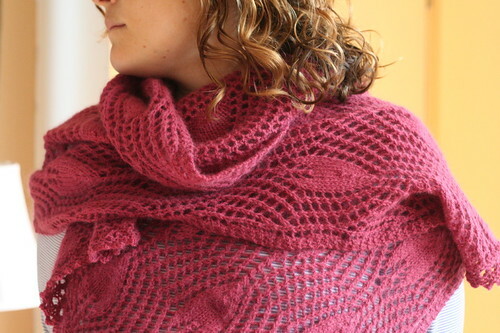 First up is i heart you (Ravelry link) by Mandy Powers. I have admired this pattern ever since Mandy published it and I thought it would be a great way to use up some Brown Sheep Nature Spun Sport scraps in a sweater for Beatrix. Beatrix liked the idea too. So much so that she wanted to “help knit”. Fortunately, the knitted fabric remains intact after her assistance; the small skeins of colored yarn for the hearts are piled up in a tangled mess. At first, I thought I would spend an evening untwisting the yarn. Now, I think it would probably be best to find more. So much for a stashbuster. Thanks, Beatrix! 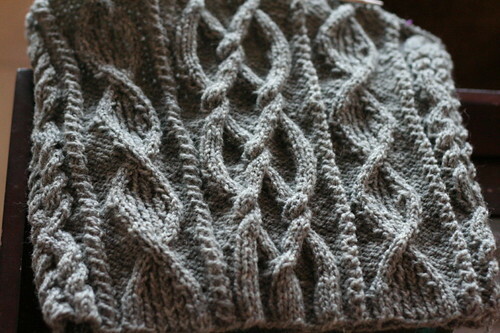 The other project I’m working on is a cabled pullover for me. I have not yet decided if I will write up a pattern for this or just knit it for myself. Much will depend on how easy the shaping proves at the shoulders and neck. I worked furiously on this for a few weeks, but set it down once I reached the armholes, as I now have some more math to do before proceeding. They say babies only come once the knitting is done. Well, it’s done and I’m waiting. Less and less patiently, but I’m waiting.